The artistry of nonfiction is the great unexplored territory of contemporary criticism. Although the American book clubs now emphasize nonfiction and The New York Times Book Review publishes almost three times as many reviews of nonfiction as fiction, critical appreciation of this work has lagged behind. The Art of Fact is the first comprehensive examination of five of today's most popular and important nonfiction artists: Gay Talese, Tom Wolfe, John McPhee, Joan Didion, and Norman Mailer. By discussing contemporary literary nonfiction in relation to the early prose narrative forms and to the news/novels of the seventeenth and eighteenth centuries, the opening chapter defines the discourse known as literary or artistic nonfiction. Dr. Lounsberry then describes four characteristics of literary nonfiction and grounds these characteristics in contemporary works. 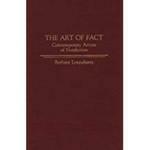 Lounsberry, Barbara, "The Art of Fact: Contemporary Artists of Nonfiction" (1990). Faculty Book Gallery. 458.